(Nanowerk News) Brown algae contain phlorotannins, aromatic (phenolic) compounds that are unique in the plant kingdom. As natural antioxidants, phlorotannins are of great interest for the treament and prevention of cancer and inflammatory, cardiovascular and neurodegenerative diseases. Researchers at the Végétaux marins et biomolécules (CNRS/UPMC) laboratory at the Station biologique de Roscoff, in collaboration with two colleagues at the Laboratoire des sciences de l'Environnement MARin (Laboratory of Marine Environment Sciences) in Brest (CNRS/UBO/IFREMER/IRD) have recently elucidated the key step in the production of these compounds in Ectocarpus siliculosus, a small brown alga model species. The study also revealed the specific mechanism of an enzyme that synthesizes phenolic compounds with commercial applications. These findings have been patented and should make it easier to produce the phlorotannins presently used as natural extracts in the pharmaceutical and cosmetic industries. The results have also been published online on the site of the journal The Plant Cell ("Structure/Function Analysis of a Type III Polyketide Synthase in the Brown Alga Ectocarpus siliculosus Reveals a Biochemical Pathway in Phlorotannin Monomer Biosynthesis"). Until now, extracting phlorotannins from brown algae for use in industry was a complex process, and the biosynthesis pathways of these compounds were unknown. 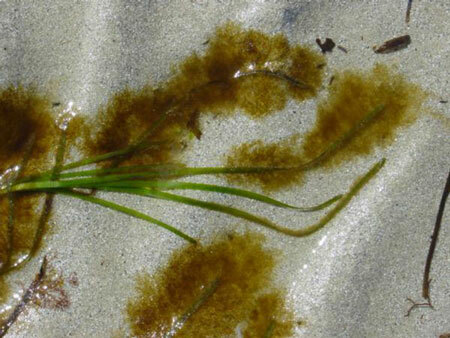 By studying the first genome sequenced from a brown alga, the team in Roscoff identified several genes homologous to those involved in phenolic compound biosynthesis in terrestrial plants (1). Among these genes, the researchers found that at least one was directly involved in the synthesis of phlorotannins in brown algae. They then inserted these genes into a bacterium, which thus produced a large quantity of the enzymes that could synthesize the desired phenolic compounds. One of these enzymes, a type III polyketide synthase (PKS III), was studied in detail and revealed how it produces phenolic compounds. PKS III is able, for example, to synthesize phloroglucinol (notably used in antispasmodic drugs and in explosives) and other phenolic compounds with commercial applications. Besides this mechanism, results revealed that the compounds had other biological functions in the acclimation and adaptation of brown algae to salinity stress. Knowledge of these biosynthesis pathways would allow researchers to uncover the signaling mechanisms that regulate this metabolism. It would also be useful for understanding the biological and ecological functions of these compounds in other brown algae that are already used commercially. This work was initiated with the support of the scientific interest group (GIS) Europole Mer. It culminated in the creation of IDEALG, a project launched in September 2011 as part of France's Investments for the Future program and led by the Station Biologique de Roscoff. IDEALG is a 10-year research scheme involving more than one hundred scientists. It aims to find biotechnology applications for genomic and post-genomic research, as well as exploit marine macroalgal bioresources. A CNRS patent has been filed and in-depth work on structural biology and controlled mutagenesis is being pursued as part of IDEALG. It should lead to new paths for protein engineering, which will make it possible to produce molecules of interest directly and more easily. This will be achieved using bacteria, thus avoiding the production of plant organic matter (biomass), whose purification is hampered by the difficult extracting process of natural phlorotannins. (1) Phenolic compounds: aromatic chemical compounds from plants. Phenolic compounds represent a class of substances long known in French as matières tannoïques (tanoic substances). The tannins are one of the four main families of phenolic compounds.